To Meat Loaf, two out of three wasn’t bad. For the Minnesota Wilderness, two out of three wasn’t quite good enough. Tuesday night’s 3-2 overtime win moved the Wilderness (35-13-6) two points behind division-leading Fairbanks with two games in hand and six games remaining in the regular season. IN THE NEIGHBORHOOD: Wilderness adventure! 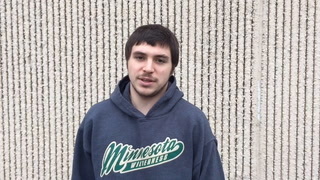 Darian Romanko scored the game-winning goal in all three games of a rare tripleheader between the teams last week as the Wilderness vaulted into first place in the league’s Midwest Division.